The Healey has long, low, rakish lines and smooth contours. Open semi-circular wheel arches are used both at the front and at the rear. As mentioned in the March 14  issue of this journal, the Alvis-engined open two-three seater is available in this country as an alternative to the Riley engined Healeys. An early version of this car has recently been tested both in this country and on the Continent, where the performance figures were obtained. The 3-litre is no ordinary stark open sports car, but a sports convertible - a car fully equipped and both snug and lockable in the closed position, yet one that can be completely open without any visible sign that a hood is being carried. Mounted on the well-known Healey chassis, the shell for this all-enveloping body is produced by Panelcraft, of Birmingham, and trimmed at the Healey works at Warwick. The six-cylinder engine used to power this model develops the same maximum power output (106 b.h.p.) 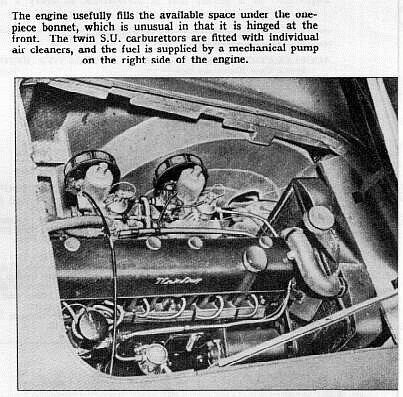 as the 2.5-litre Riley engine used in some of the other models, but at a lower speed - 4,200 compared with 4,800 r.p.m. ; also the maximum torque occurs at a very much lower speed in the larger engine, although the actual torque figure is only 4 lb-ft greater. 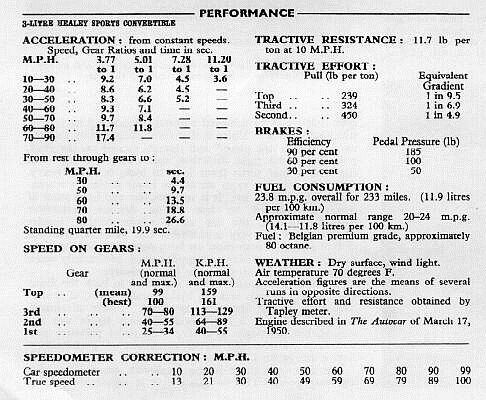 This difference in engine characteristics, together with a slight decrease in weight, results in a gain in the acceleration figures, yet the ultimate maximum speed of around the hundred mark is a little less than that recorded by The Autocar for the saloon model. The axle ratio, giving a road speed of 20.6 m.p.h. per 1,000 r.p.m., results in a road speed of 86.5 m.p.h. at maximum power output, so that for the ultimate maximum speed the engine is well past its peak. However, this is a speed seldom used under normal road conditions, whereas the acceleration qualities are sampled whenever the car is driven. The Healey is a car that seems to thrive on high-speed cruising and is quite happy at around the 80 mark. The limiting factors are usually road conditions; the way the driver feels and how much of a hurry he may be in. Under favourable conditions averages of well over 40 m.p.h. for quite long periods are quite possible. The smooth six-cylinder engine purrs away in a very willing manner, with no suspicion of fuss or over-work. There was slight pinking on Pool fuel of approximately 72 octane, though on 80 octane, on which the performance testing was carried out, pinking was negligible. Driven in a leisurely way, the Healey is very much a top gear car. On the other hand, if the driver wishes, the car is ready and willing for really fast motoring, and then the gears can be freely used. The gear ratios enable relatively high speeds to be obtained on both second and third gears without over-revving the engine. The gear change is particularly pleasant and quick, the centrally placed remote control lever is short and positive with just about the right amount of travel from gear to gear. A slice up from third to top when the car is speeding to the upper seventies is a particularly pleasant manoeuvre; the car seems to enter into the spirit of the exercise, too. One criticism of the gear box is that it is stiff to engage first gear when the car is at rest, but once on the move the box leaves little to be desired as regards its changing qualities, although the gears are a little more audible than some. This is perhaps justifiable on a car of this type, where extra sound-deadening material would only increase the weight and adversely affect performance. A quick change down to third results in hills of the order of 1 in 6 being climbed at over 40 m.p.h., leaving two lower gears in hand for the really steep ones! The less steep main road slopes normally require no change down at all. No matter what type of body it is fitted with, the Healey chassis gives the car a controlled, taut feel. The ride is a little hard, perhaps by present-day standards, but a softening of the suspension would be warranted on this type of car only if it could be achieved without prejudicing its general handling qualities. There is that comforting feeling that the car is "all in one piece," and intends to stay on the road, pointing in the right direction, too. The steering, with two and a half turns from lock to lock, is fairly heavy, especially with the tyres set at the lower pressures recommended for normal use. It is very positive and has a sense of precision bettered by few. The definite understeer characteristics of the car as a whole further inspire confidence in this very controllable car. A certain amount of tyre squeal is noticeable on both cornering and braking, but this is not excessive and applies more particularly when the car is driven with the lower tyre pressures. Eleven-inch diameter brakes are fitted to both the front and the rear wheels and the hydraulically operated brakes have two leading shoes at the front. Under maximum braking conditions a very good efficiency figure was recorded, but to obtain it a very high pedal pressure was necessary. Under the severe conditions of performance testing no brake fade was experienced. effectively insulates the driver from minor road shocks, though on a long journey a certain amount of discomfort was experienced from the bottom of the back rest being a trifle hard. A wide folding armrest effectively divides the seat when only two persons are carried. Three abreast seating is possible, although it is rather cramped for anythmg but short journeys. The steering wheel can be adjusted by means of a telescopic column with the normal screw type of locking arrangement. All the pedals are well placed and there is plenty of room for the driver’s left foot when it is not operating the clutch pedal. The organ pedal type of throttle control is smooth to operate, but its position relative to the brake pedal could be improved to facilitate the heel and toe type of gear changing. The dip switch, mounted to the left of the clutch pedal, is conveniently placed for quick operation. The minor controls on the car tested were conveniently ranged in two groups, one on either side of the instruments. On future production cars extra instruments will be included and the switches arranged in a row below the speedometer and tachometer units, while a radio control panel and heater fan switch, both auxiliaries being standard equipment, are fitted on the facia on the right of the steering column. A useful locker with lockable lid is fitted in the left of the facia. From the driving seat the forward visibility is very good and the windscreen pillars are particularly slender, especially in view of the fact that a separate yet fixed triangular light is fitted. With the hood in the raised position the unusually large rear window produces a very light interior. The material from which it is made is not, however, quite as transparent as could be desired; consequently, the mirror view is somewhat indistinct. This is particularly so at night and in rain or when the sun is shining on the back of the car. 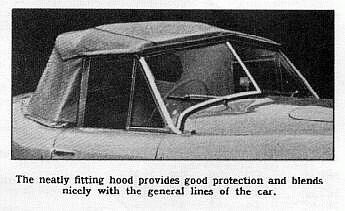 The hood mechanism, which is completely enclosed when the hood is in the lowered position, is very simple to operate and can be very quickly erected, although it is first helpful to slide the seat forward so that the back rest can be hinged forward to gain access to the hood compartment. 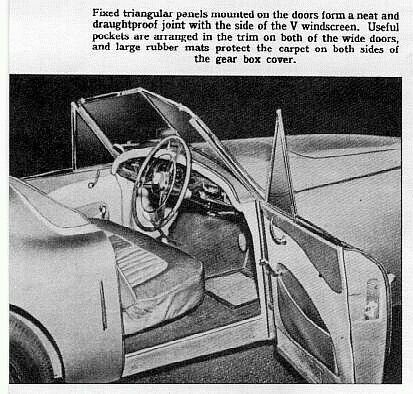 Glass winding side windows are used, and it is possible to lock the car - a very desirable feature, but one seldom found on an open sports car. The luggage locker is of ample proportions for a car of this seating capacity and this, too, is lockable. 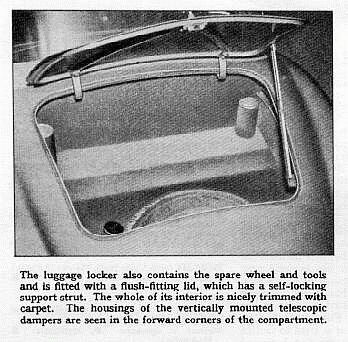 The fuel filler cap is placed inside the luggage locker. Built-in head lamps mounted in the front wings are powerful and have a good range. Yet it would be better for fast night driving if still more powerful lights could be fitted. The horn, controlled by a ring on the steering wheel, has a pleasing note but the control is a little stiff to operate. Starting from cold, with the aid of the manually operated electrically controlled starting device, was very good. There is the valuable feature of a reserve petrol supply, brought into use by a facia switch. The 3-litre Healey offers a combination of both open and closed car motoring at high speed coupled with good petrol economy.